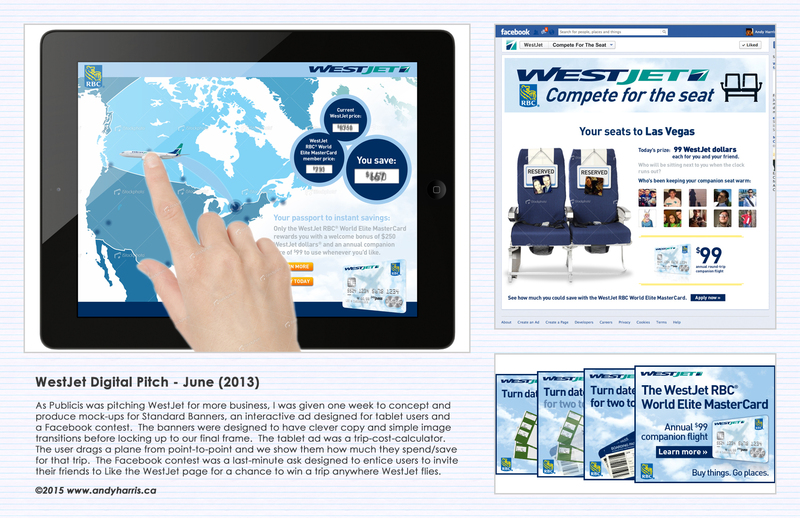 WestJet Digital Pitch – June (2013) As Publicis was pitching WestJet for more business, I was given one week to concept and produce mock-ups for Standard Banners, an interactive ad designed for tablet users and a Facebook contest. The banners were designed to have clever copy and simple image transitions before locking up to our final frame. The tablet ad was a trip-cost-calculator. The user drags a plane from point-to-point and we show them how much they spend/save for that trip. 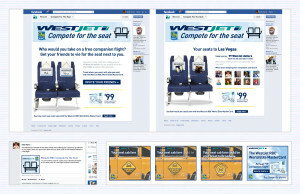 The Facebook contest was a last-minute ask designed to entice users to invite their friends to Like the WestJet page for a chance to win a trip anywhere WestJet flies.